In a rare act of generosity and solidarity with the marginalized, Mr. Timir Patel and Ms. Seema Patel donated Soneshvar House, their ancestral house, to ActionAid Association India. Through Husti Initiative, London, their family trust registered in the United Kingdom, they will be supporting us to run Umeed Education and Support Centre, to provide quality education to children from excluded communities, and sustainable livelihood training through computer literacy, life-skills and leadership-building to adolescent girls. Located in Dabhoi in Vadodara district of Gujarat, the centre will run in their ancestral home and the nearly 7,000 sq. ft. of land on which it stands. The handing-over of the house and the inauguration of Umeed Centre took place on February 14 in an atmosphere of songs, dance and cultural performances. 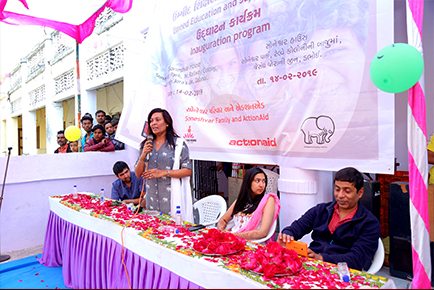 The event saw the participation of nearly 200 people, including the local community members from Dabhoi, government officials, advocates and civil society members.